Following big market moves like we have seen in the last six months, a number of market characteristics tend to change as some new leadership groups emerge and others fall by the wayside. 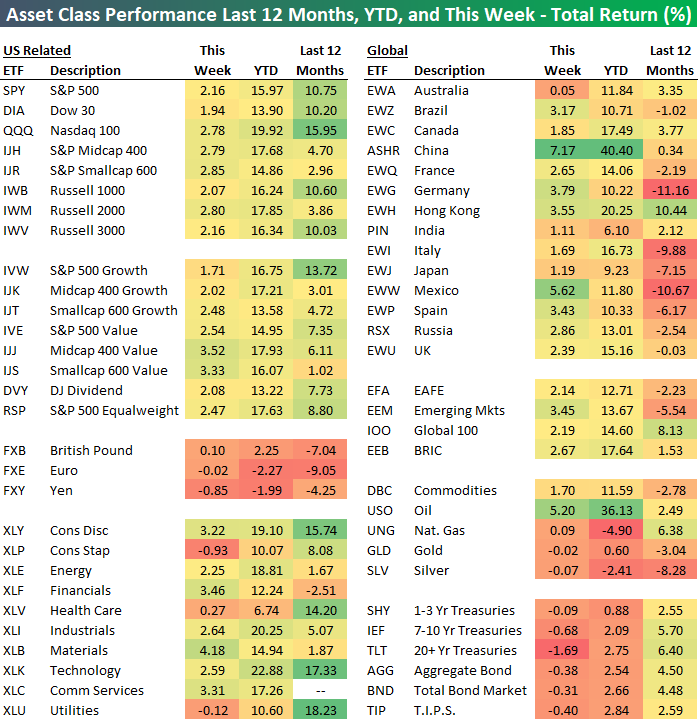 In order to help get a better idea of what sectors and groups have been driving the market, in this week’s Bespoke Report, we are providing a ‘chart checkup’ of all the S&P 500 Industries as well as providing updates to some key market and economic charts that we feel are important to highlight. It was a banner week for US equities and a great encore to a strong first quarter. With the exception of the Dow (DIA), every major index ETF was up over 2%. Value outperformed growth across all three market caps, but the margin between the two was pretty narrow. Defensive sectors like Consumer Staples (XLP) and Utilities (XLU) actually saw modest declines this week, while Materials (XLB), Financials (XLF), Communication Services (XLC), and Consumer Discretionary (XLY) all rallied over 3%. In international markets, China (ASHR) surged over 7%, while Mexico (EWW) bounced over 5%. Australia (EWA) was the only country up less than 1%. Fixed income ETFs saw modest declines across the board. This week’s report is loaded with over 95 pages of charts and tables analyzing the various market moves. To read the Bespoke Report and access everything else Bespoke’s research platform has to offer, start a two-week free trial to one of our three membership levels. You won’t be disappointed!